Horse training and breeding developed early on in Etruria. There is evidence of an interchange between the Greeks and Etruscans of horses and their breeding techniques. Because the Greeks colonized parts of the Italian peninsula, no doubt their horses came with them. Discovery of early Celtic horses in northern Italy show they were very small, although this did nothing to decrease the demand for them. Greek horses at first were of the smaller variety, but the lot was improved by the importation of eastern horses by 700 B.C. coinciding with the early equestrian games. The literature of Greek horses is best represented by the writings of Aristotle and Xenophon. Philip of Macedonia imported some twenty thousand Scythian mares, and his son, Alexander the Great, is said to have gained some fifty thousand eastern horses in the Persian spoils. As a result of the cross breeding practices, the larger bodied horses used for cavalry were produced. During the more than four centuries of the Roman army's existence, it changed from predominantly infantry to one of cavalry led forces. Because the type of enemy they encountered changed on the frontiers (Persians who had all cavalry forces, the mounted Germanic tribes), the Romans came to depend on a counter measure in the shape of increased cavalry. 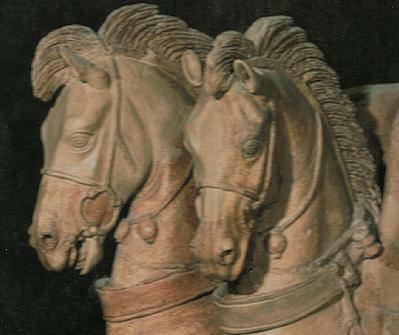 The experts in this field, that is, the best providers of cavalry mounts, were the Etruscans. War horses and war chariots, (said to have been the inspiration for the Celtic war chariot), were not the only expertise of the Etruscans. That the Etruscans were artists in many fields is evident in their beautiful workmanship of equine bridles and buckles and other ornamentation for their horses. The fine representation of animals appear on bronze horse buckles excavated at Vetulonia (c. 700). There are numerous tomb paintings of the beautiful equines throughout Etruria. The importance of horses with the Etruscans is further indicated among the excavations at Murlo. A frieze shows a portrayal of a horse race. Livy writes that when the first games at Rome were celebrated in the reign of the Etruscan king Tarquinius Priscus, most of the horses came from Etruria. Indeed, the Etruscans used the area of the stadium of the Circus Maximus for horse racing prior to its construction by the Romans during the second century B.C. In the horse races in Greece, Etruscan horses nearly always were the predominant favorites. Livy I, 35. in JRS LXVIII (1978), p. 138 Bökönyi, S. in Meklenberg Collection, Part 1, Data on Iron Age Horses of Central and Eastern Europe, American School of Prehistoric Research, Peabody Museum, Harvard University, 1968.